I am one of the most popular house pets in America. You might have heard rumors that I don�t have a very good personality, and, for a time many years ago, this was true. The reason was that I was so popular that our breed was overproduced. This situation has since been corrected and I am my happy, congenial self again. I am also intelligent and very good with children. I love to play- especially with balls. Maybe it's because I am an instinctive bird hunter - - I love to play the game called "fetch". My relatives come in three colors: black, parti-color, and any solid color other than black. I have to have a little help with my coat to keep it looking its best, but I can be quite a head-turner with just a little effort. Of course, I don't have to have this fancy hairdo that you see me wearing here unless you and I are going to strut our stuff at the dog shows. When fully grown, I am between 15 and 16 inches tall (38.1 to 40.6 centimeters) and I weigh between 28 and 32 pounds (12.6 to 14.4 kilograms). 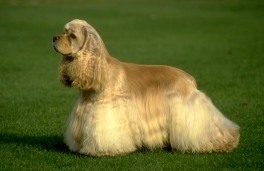 We have no Cocker Spaniel Breeders listed at this time. Click here to place your Cocker Spaniel Ad!